1 of 3 Heat oven to 300 degrees F. Divide cheese evenly among tortillas, sprinkling cheese over half of each tortilla. Top each tortilla with 1 tablespoon of the salsa. Divide avocado among tortillas. Fold tortillas in half, pressing gently. 2 of 3 Heat a large skillet over medium-high heat for 2 minutes; reduce heat to medium. Cook 2 of the quesadillas for 2 to 3 minutes or until lightly browned and cheese is melted, turning once. 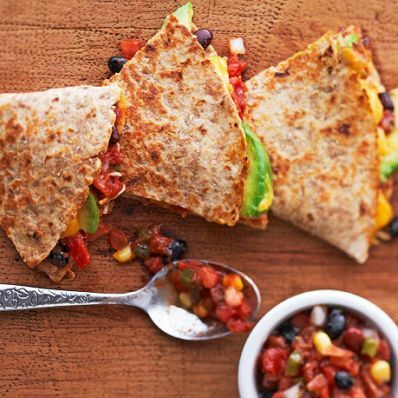 Remove quesadillas from skillet; place on a baking sheet. Keep warm in 300 degrees F oven. Repeat with remaining quesadillas, cooking 2 at a time. 3 of 3 Cut quesadillas into wedges. Serve with sour cream and remaining salsa.